JocStrap - Java/Objective-C connection library, new version 1.0.2466-18 (was 1.0.2466-17). Jocstrap is a bridge between Java and Objective-C. This is needed to write Java applications for IPhone. Just in case you don't have Cydia and Java installed on your IPhone, follow these instructions: Tutorial: install Java on the IPhone. 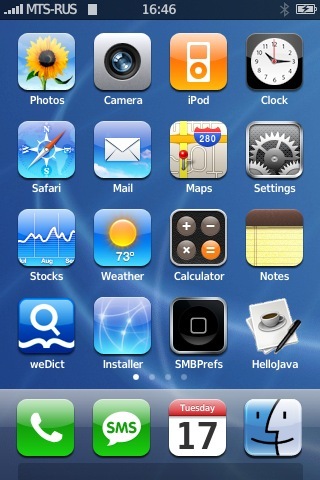 This is another simple Java GUI application for the IPhone/IPod from Java Flavor Weblog. 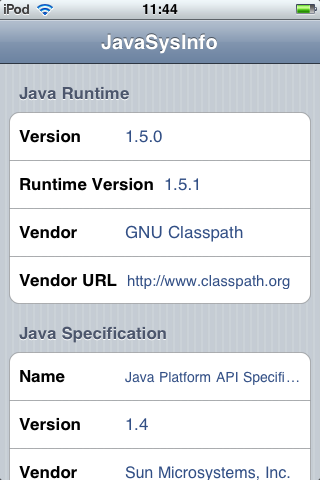 It simply shows Java system information on iPhone/iPod touch. It uses Java, JocStrap and GNU Classpath. This application can be installed through Installer. Just add the repository http://javaflavor.cocolog-nifty.com/apptapp/. The application can be found in Java section and is called JavaSysInfo. Or just download it here: javasysinfo-092.zip. The package includes compiled class files, source java files and runnable script with an icon. Here are the sources: JavaSysInfo and JavaSysInfoController. Note that JocStrap applications, including JavaSysInfo, currently require JocStrap, UICaboodle, JamVM, GNU Classpath, GNU Classpath Tools, Apache APR, libffi and BSD Subsystem. In most cases all this was installed during Java on IPhone installation. During Java instalation there was sample programm installed. It is called HelloJava. It is a bit more complicated than basic console HelloWorld-type application, that we tried to compile and run during this tutorial. HelloJava uses gui and SQLite. It uses several classes, that are bridges to IPhone's functionality (GUI, sound, SQL, etc). 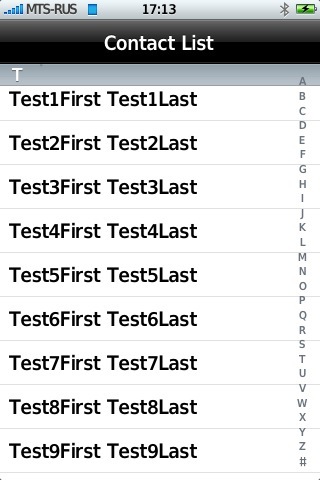 But all that it does is it reads contacts' first and last names from IPhone's database (throught SQL select statement) and shows them on the screen in GUI mode. It also produses simple sound in the end.